When it is deployed to space, the James Webb Space Telescope (JWST) will be the most powerful and advanced telescope ever deployed. As the spiritual and scientific successor to the Hubble, Spitzer, and Kepler Space Telescopes, this space observatory will use its advanced suite of infrared instruments to look back at the early Universe, study the Solar System, and help characterize extra-solar planets. Unfortunately, after many delays, there’s some good news and bad news about this mission. The good news is that recently, the Independent Review Board (IRB) established by NASA to assess the progress on the JWST unanimously decided that work on the space telescope should continue. The bad news is that NASA has decided to push the launch date back again – this time to March 30th, 2021. As part of their assessment, the IRB was established in April of 2018 to address a range of factors influencing Webb’s schedule and performance. These included the technical challenges and tasks that need to be tackled by its primary contractor (Northrop Grumman) before the mission can launch. A summary of the report’s recommendations, and NASA’s response, can be read here. The anomaly mentioned in the report refers to the “anomalous readings” that were detected from the telescope during vibration testing back in December 2016. NASA responded to this by giving the project up to 4 months of schedule reserve by extending the launch window. However, in 2017, NASA delayed the launch window again by 5 months, from October 2018 to a between March and June 2019. This delay was requested by the project team, who indicated that they needed to address lessons learned from the initial folding and deployment of the observatory’s sun shield. In February of 2018, the Government Accountability Office (GAO) issued a report that expressed concerns over further delays and cost overruns. Shortly thereafter, the JWST’s Standing Review Board (SRB) made an independent assessment of the remaining tasks. In May of 2018, NASA issued a statement indicating that they now estimated that the launch window would be some time in May 2020. However, they chose to await the findings of the IRB and consider the data from the JWST’s Standing Review Board before making the final determination. The new launch date was set to accommodate environmental testing and work performances challenges on the sunshield and propulsion system. In the end, the IRB, SRB and NASA are all in total agreement that the James Webb Space Telescope is a crucial mission that must be seen through. In addition to shedding light on a number of mysteries of the Universe – ranging from the earliest stars and galaxies in the Universe to exoplanet habitability – the JWST will also complement and enhance the discoveries made by other missions. The JWST will also be the first telescope of its kind, being larger and more complex than any previous space telescope – so challenges were anticipated from its very inception. In addition, the final phase consists of some of the most challenging work, where the 6.5-meter telescope and science payload element are being joined with the spacecraft element to complete the observatory. The science team also needs to ensure that the observatory can be folded up to fit inside the Ariane 5 rocket that will launch it into space. They also need to ensure that it will unfold again once it reaches space, deploy its sunshield, mirrors and primary mirror. Beyond that, there are also the technical challenges of building a complex observatory that was created here on Earth, but designed to operate in space. As a collaborative project between NASA, the European Space Agency (ESA), and the Canadian Space Agency (CSA), the JWST is also representative of the new era of international cooperation. As such, no one wishes to see the mission abandoned so close to completion. In the meantime, any delays that allow for extra testing will only ensure success in the long run. Good luck JWST, we look forward to hearing about your first discoveries! The Ariane 5 rocket is a workhorse for delivering satellites and other payloads into orbit, but fitting the James Webb Space Telescope (JWST) inside one is pushing the boundaries of the Ariane 5’s capabilities, and advancing our design of space observatories at the same time. The Ariane 5 is the most modern design in the ESA’s Ariane rocket series. It’s responsible for delivering things like Rosetta, the Herschel Space Observatory, and the Planck Observatory into space. The ESA is supplying an Ariane 5 to the JWST mission, and with the planned launch date for that mission less than three years away, it’s a good time to check in with the Ariane 5 and the JWST. The Ariane 5 has a long track record of success, often carrying multiple satellites into orbit in a single launch. Here’s its most recent launch, on January 27th from the ESA’s spaceport in French Guiana. This is Ariane 5’s 70th successful launch in a row. But launching satellites into orbit, though still an amazing achievement, is becoming old hat for rockets. 70 successful launches in a row tells us that. The Ariane 5 can even launch multiple satellites in one mission. But launching the James Webb will be Ariane’s biggest challenge. The thing about satellites is, they’re actually getting smaller, in many cases. But the JWST is huge, at least in terms of dimensions. The mass of the JWST—6,500 kg (14,300 lb)—is just within the limits of the Ariane 5. The real trick was designing and building the JWST so that it could fit into the cylindrical space atop an Ariane 5, and then “unfold” into its final shape after separation from the rocket. This video shows how the JWST will deploy itself. The JWST is like a big, weird looking beetle. Its gold-coated, segmented mirror system looks like multi-faceted insect eyes. Its tennis-court sized heat shield is like an insect’s shell. Or something. Cramming all those pieces, folded up, into the nose of the Ariane 5 rocket is a real challenge. 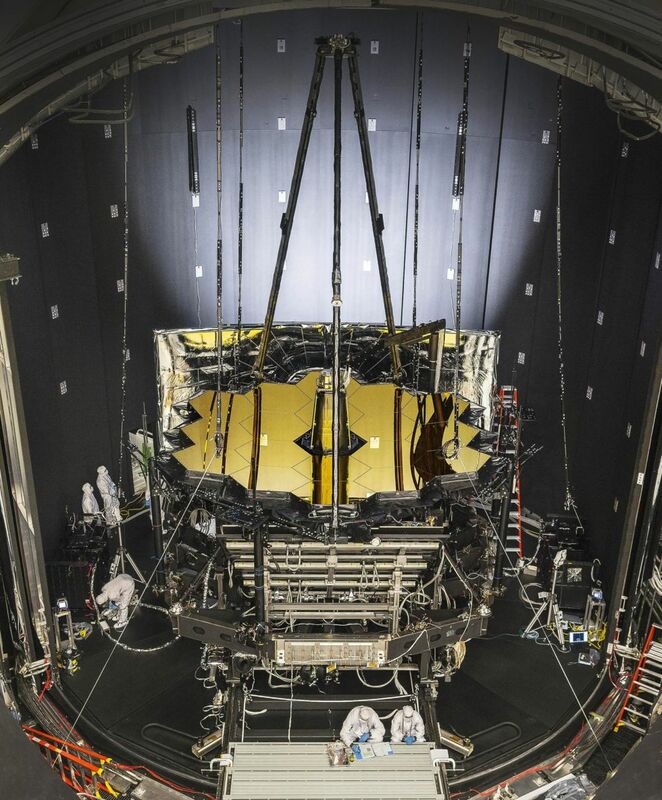 Because the JWST will live out its 10-year (hopefully) mission at L2, rather than in orbit around Earth, it requires this huge shield to protect itself from the sun. The instruments on the James Webb have to be kept cool in order to function properly. The only way to achieve this is to have its heat shield folded up inside the rocket for launch, then unfolded later. That’s a very tricky maneuver. The heart of the James Webb is its segmented mirror system. This group of 18 gold-coated, beryllium mirrors also has to be folded up to fit into the Ariane 5, and then unfolded once it’s separated from the rocket. This is a lot trickier than launching things like the Hubble, which was deployed from the space shuttle. Something else makes all this folding and unfolding very tricky. The Hubble, which was James Webb’s predecessor, is in orbit around Earth. That means that astronauts on Shuttle missions have been able to repair and service the Hubble. But the James Webb will be way out there at L2, so it can’t be serviced in any way. We have one chance to get it right. Right now, the James Webb is still under construction in the “Clean Room” at NASA’s Goddard Space Flight Centre. A precision robotic arm system is carefully mounting Webb’s 18 mirrors. There’s still over two years until the October 2018 launch date, and there’s a lot of testing and assembly work going on until then. We’ll be paying close attention not only to see if the launch goes as planned, but also to see if the James Webb—the weird looking beetle—can successfully complete its metamorphosis. After years of construction, the first of 18 primary flight mirrors has been installed onto NASA’s James Webb Space Telescope (JWST) at the agency’s Goddard Space Flight Center in Greenbelt, Maryland, signifying the start of the final assembly phase for the mammoth observatory that will eventually become the most powerful telescope ever sent to space. The milestone first mirror installation was achieved this week just ahead of the Thanksgiving holiday as the engineering team, working inside the massive clean room at NASA Goddard, used a robotic arm to precisely lift and lower the gold coated mirror into place on the observatory’s critical mirror holding backplane assembly. People often criticize the amount of money spent on space exploration. Sometimes it’s well-meaning friends and family who say that that money is wasted, and would be better spent on solving problems here on Earth. In fact, that’s a whole cultural meme. You see it played out over and over in the comments section whenever mainstream media covers a space story. While solving problems here on Earth is noble, and the right thing to do, it’s worth pointing out that the premier space exploration body on Earth, NASA, actually has a tiny budget. When you compare NASA’s budget to what people spend on cigarettes, NASA looks pretty good. Ignoring for the moment the fact that we don’t know how to solve all the problems here on Earth, let’s look at NASA’s budget over the years, and compare it to something that is truly a waste of money: cigarettes and tobacco. NASA is over 50 years old. In its first year, its budget was $89 million. (That’s about $732 million in today’s dollars.) In that same year, Americans spent about $6 billion on cigarettes and tobacco. From 1969 to 1972, NASA’s Apollo Program landed 12 men on the Moon. They won the Space Race and established a moment that will echo through the ages, no matter what else humanity does: the first human footsteps anywhere other than Earth. In those four years, NASA’s combined budget was $14.8 billion. In that same time period, Americans spent over twice as much—$32 billion—on smoking. In 1981, NASA launched its first space shuttle, the Columbia (STS-1). NASA’s budget that year was $5.5 billion. That same year, the American population spent about $17.4 billion on tobacco. That’s three times NASA’s budget. How many more shuttle flights could there have been? How much more science? In 1990, NASA launched the Hubble Space Telescope into Low Earth Orbit (LEO.) The Hubble has been called the most successful science project in history, and Universe Today readers probably don’t need to be told why. The Hubble is responsible for a laundry list of discoveries and observations, and has engaged millions of people around the world in space science and discovery. In that year, NASA had a budget of $12.4 billion. And smoking? In 1990, Americans smoked their way through $26.5 billion of tobacco. MSL Curiosity selfie on the surface of Mars. Image: NASA/JPL/Cal-Tech. In 2012, NASA had a budget of $16.8 billion. In that year, NASA successfully landed the Mars Science Laboratory (MSL) Curiosity on Mars, at a cost of $2.5 billion. Also that year, American lungs processed $44 billion worth of tobacco. That’s the equivalent of 17 Curiosity rovers! There was an enormous scientific debate around where Curiosity should land, in order to maximize the science. Scientific teams competed to have their site chosen, and eventually the Gale Crater was selected as the most promising site. Gale is a meteor crater, and was chosen because it shows signs of running water, as well as evidence of layered geology including clays and minerals. But other equally tantalizing sites were in contention, including Holden Crater, where a massive and catastrophic flood took place, and where ancient sediments lie exposed on the floor of the crater, ready for study. Or Mawrth Vallis, another site that suffered a massive flood, which exposed layers of clay minerals formed in the presence of water. With the money spent on tobacco in 2012 ($44 billion!) we could have had a top ten list of landing sites on Mars, and put a rover at each one. Think of all that science. NASA’s budget is always a source of controversy, and that’s certainly true of another of NASA’s big projects: The James Webb Space Telescope (JWST.) Space enthusiasts are eagerly awaiting the launch of the JWST, planned for October 2018. The JWST will take up residence at the second Lagrange Point (L2,) where it will spend 5-10 years studying the formation of galaxies, stars, and planetary systems from the Big Bang until now. It will also investigate the potential for life in other solar systems. Initially the JWST’s cost was set at $1.6 billion and it was supposed to launch in 2011. But now it’s set for October 2018, and its cost has grown to $8.8 billion. It sounds outrageous, almost $9 billion for a space telescope, and Congress considered scrapping the entire project. But what’s even more outrageous is that Americans are projected to spend over $50 billion on tobacco in 2018. When people in the future look back at NASA and what it was able to accomplish in the latter half of the 20th century and the beginning of the 21st century, they’ll think two things: First, they’ll think how amazing it was that NASA did what it did. The Moon landings, the Shuttle program, the Hubble, Curiosity, and the James Webb. Then, they’ll be saddened by how much more could’ve been done collectively, if so much money hadn’t been wasted on something as deadly as smoking. NASA GODDARD SPACE FLIGHT CENTER, MD – The construction pace for NASA’s James Webb Space Telescope (JWST) took a major leap forward with delivery of the actual flight structure that serves as the observatory’s critical mirror holding backbone – to NASA’s Goddard Space Flight Center in Greenbelt, Maryland and observed by Universe Today. And the mammoth $8.6 Billion Webb telescope has mammoth scientific objectives as the scientific successor to NASA’s Hubble Space Telescope (HST) – now celebrating its 25th anniversary in Earth orbit. “JWST has the capability to look back towards the very first objects that formed after the Big Bang,” Mather told Universe Today. “James Webb has a much bigger mirror than Hubble. So its resolution is much better,” said astronaut and NASA science chief John Grunsfeld, during an exclusive interview at NASA Goddard. Grunsfeld flew on a trio of Hubble servicing missions aboard the Space Shuttle, including the final one during STS-125 in 2009. These discoveries are only possible with Webb, which will become the most powerful telescope ever sent to space when it launches in 2018. The massive JWST flight structure unit includes the “backplane assembly” that clasps in place all of the telescopes primary and secondary mirrors, as well as its ISIM science module loaded with the observatory’s quartet of state-of-the-art research instruments. “The backplane looks really great,” Grunsfeld told me. Numerous NASA centers and aerospace companies are involved in building the observatory and its backplane structure holding the mirrors that will search back some 13.4 billion years. “The backplane structure just arrived in late August from Northrop Grumman Aerospace Systems in Redondo Beach, California,” said Sandra Irish, JWST lead structural engineer during an interview with Universe Today at the NASA Goddard cleanroom facility. 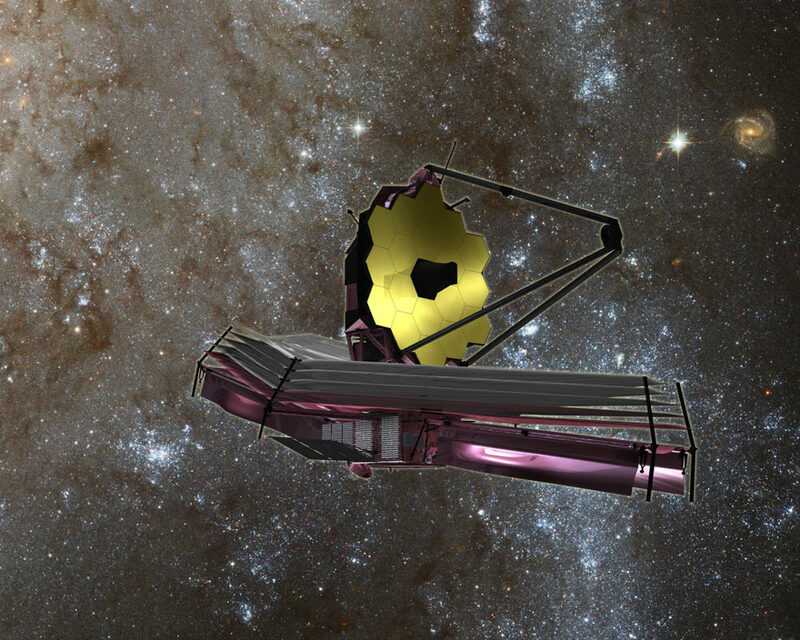 The purpose of JWST’s backplane assembly is to hold the telescopes 18 segment, 21-foot (6.5-meter) diameter primary mirror nearly motionless while floating in the utterly frigid space environment, thereby enabling the observatory to peer out into deep space for precise science gathering measurements never before possible. The massive telescope structure “includes the primary mirror backplane assembly; the main backplane support fixture; and the deployable tower structure that lifts the telescope off of the spacecraft. The three arms at the top come together into a ring where the secondary mirror will reside,” say officials. The backplane traveled a long and winding road before arriving at Goddard. “The backplane structure was designed and built at Orbital ATK with NASA oversight,” Irish explained. The assembly work was done at the firms facilities in Magna, Utah. The observatory’s complete flight structure measures about 26 feet (nearly 8 meters) from its base to the tip of the tripod arms and mirror mount holding the round secondary mirror. The flight structure and backplane assembly arrived at Goddard in its stowed-for-launch configuration after being flown cross country from California. “It is here for the installation of all the mirrors to build up the entire telescope assembly here at Goddard. It will be fully tested here before it is delivered to the Johnson Space Center in Houston and then back to California,” Irish elaborated. The overall assembly is currently attached to a pair of large yellow and white fixtures that firmly secure the flight unit, to stand it upright and rotate as needed, as it undergoes acceptance testing by engineers and technicians before commencement of the next big step – the crucial mirror installation that starts soon inside the world’s largest cleanroom at NASA Goddard. Overhead cranes are also used to maneuver the observatory structure as engineers inspect and test the unit. But several weeks of preparatory work are in progress before the painstakingly precise mirror installation can begin under the most pristine cleanroom operating conditions. “Right now the technicians are installing harnesses that we need to mount all over the structure,” Irish told me. What is the construction sequence at Goddard for the installation of the mirrors and science instruments and what comes next? “The ISIM mounts all four of the telescope science instrument. So the mirrors go on first, then the ISIM gets installed and then it will really be the telescope structure.” ISIM carries some 7,500 pounds (2400 kg) of telescope optics and instruments. The actual flight mirror backplane is comprised of three segments – the main central segment and a pair of outer wing-like parts holding three mirrors each. They will be unfolded from the stowed-for-launch configuration to the “deployed” configuration to carry out the mirror installation. Then be folded back over into launch configuration for eventual placement inside the payload fairing of the Ariane V ECA booster rocket. The telescope will launch from the Guiana Space Center in Kourou, French Guiana in 2018. The telescopes primary and secondary flight mirrors have already arrived at Goddard. The mirrors must remained precisely aligned and nearly motionless in order for JWST to successfully carry out science investigations. While operating at extraordinarily cold temperatures between -406 and -343 degrees Fahrenheit the backplane must not move more than 38 nanometers, approximately 1/1,000 the diameter of a human hair. To account for the tiniest of errors and enhance science, each of the primary mirrors is equipped with actuators for minute adjustments. NASA’s team at Goddard has already practiced mirror installation because there are no second chances. “We only have one shot to get this right!” Irish emphasized. Watch for more on the mirror installation in my upcoming story. JWST is the successor to the 25 year old Hubble Space Telescope and will become the most powerful telescope ever sent to space. NASA has overall responsibility and Northrop Grumman is the prime contractor for JWST. “The telescope is on schedule for its launch in 2018 in October,” Mather told me. And the payoff from JWST will be monumental! “On everything from nearby planets to the most distant universe, James Webb will transform our view of the Universe,” Grunsfeld beams. Watch for more on JWST construction and mirror installation in part 2 soon.